Emerald City Aikido and Two Cranes Aikido are pleased to invite you to a seminar with Nakao Shingo, 7th Dan Aikikai. We are honored to have her teach at Emerald City Aikido while on a visit to Seattle. Amiee Bel Sensei , 4th Dan, is the Dojo Cho of Zenshinkan Dojo in Worcester MA. She began her training under Edward Haupt Sensei in 1996. She is a committed practitioner and is a student of Ed Germanov and Mary Heiny Sensei. In addition to Aikido, Bel Sensei is a student of Ikebana and meditation. Space is limited, please call today to reserve your space! You have two options to register; 1) complete the online form below, in the message box specify what training(s) you're wanting to attend and if you're wanting to attend the party at Ray's Boat House. For both registration options please drop off your check of mail to Emerald City Aikido, 604 19th Ave E., Seattle WA, 98112. - OR- 2) you may register by filling out the registration form. You can fill it out online and print/email. 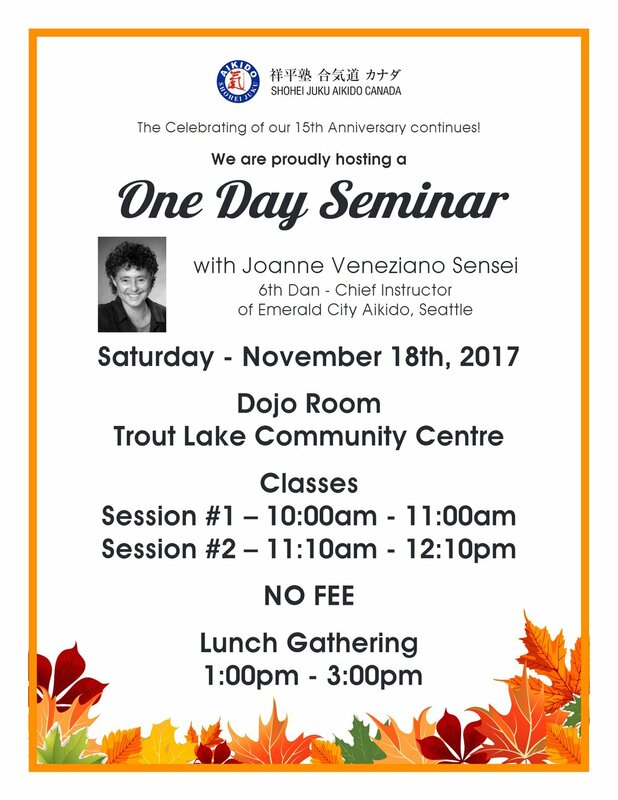 Shohei Juku Aikido Canada is hosting a one-day seminar with Joanne Veneziano Sensei. There is no fee to attend this event. Bring a friend and enjoy a FREE Introductory Class to the movements and philosophy of Aikido. Does Your Child Inspire You To Do Aikido? Introductory Offer for Parents of Enrolled Children! Taught by: Lee Crawford Sensei, Aikido Northshore, Glenn Leichman Sensei, Aikido Seattle, Joanne Veneziano Sensei, Emerald City Aikido. Be sure to join Emerald City Aikido on Tuesday October 27, 2015 for Friendship Training Class with Kimberly Richardson Sensei. O Sensei developed Aikido techniques from sword and staff movements. Developing a Boken and staff practice is a great way for students to enhance their open hand training and to stay in touch with their Aikido practice when taking time off from the mat. Explore Aikido in this free introductory workshop. Members of Emerald City Aikido will demonstrate techniques and present information about the art and its practice. You will be lead through breathing and ki exercises, blending movements, partner practice, beginning falls and a basic technique. Throughout, you will be mentored by dojo members. If you want to continue your training, we offer two months of classes for the price of one and a discount on uniforms to all new students. Aikido in Action - Practical Self Defense for Children! "Helping Children Embody Peace". Emerald City Aikido will explore: Using your voice, Grounding fear, Using the ground, Setting boundaries, The power of small, Trusting your intuition and more! This class is for students age 8 and above. Cost $40 per student. Pre-registration is required. Limited to 16 students. Call (206) 323-2322 EmeraldCityAikido@gmail.com to reserve your spot. Introduction to Aikido from Emerald City Aikido. Explore Aikido in this introductory class. 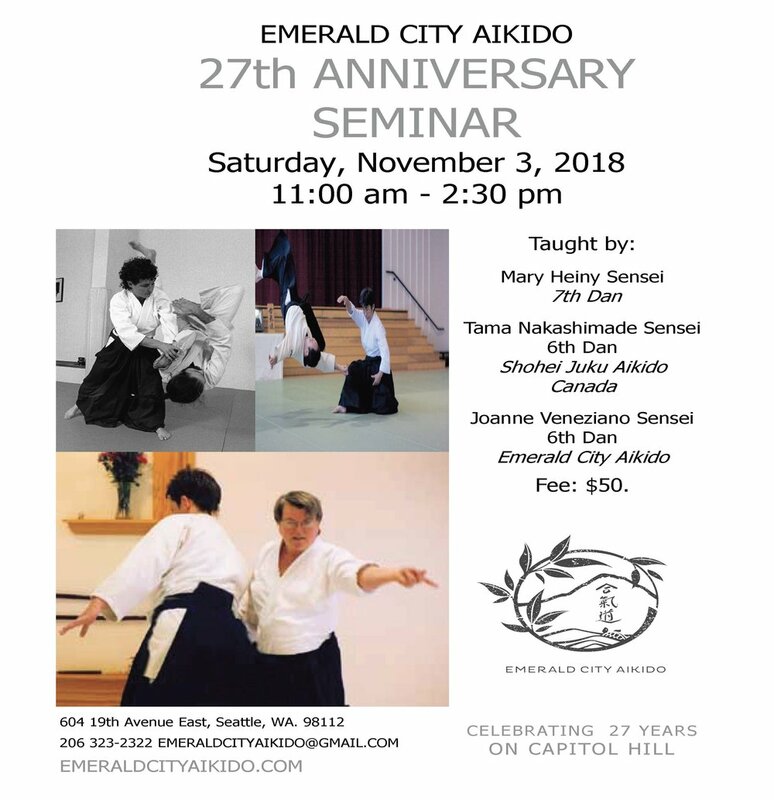 Members of Emerald City Aikido will demonstrate techniques and present information about the art and its practice and more. This class is free! Call (206) 323-2322 or EmeraldCityAikido@gmail.com to reserve your spot today! Heiny Sensei is an inspiration. Her teachings have nurtured the growth of Aikido in Seattle and throughout North America. Come and enhance your practice. O Sensei developed Aikido techniques from sword and staff movements. Developing a boken (sword) and bo (staff) practice is a great way for students to enhance their open hand training and to stay in touch with their Aikido practice when taking time off from the mat. The class will include boken and bo forms as well as throwing with the weapon and take away techniques. 9 years old and above. Ability to focus on details. The dojo will supply boken and bo, which can also be purchased. We will train outdoors if weather permits. Please note, this event has been canceled. We are honored to have Mary Heiny Sensei as our guest instructor on Tuesday, May 26th. Come and train! There is a $15 mat fee for non-ECA students. We are honored to have Mary Heiny Sensei as our guest instructor on Monday, April 20th. Come and train! We are honored to have Mary Heiny Sensei as our guest instructor on Tuesday, April 14th. Come and train! Please join us for a demonstration by Emerald City Aikido’s Children’s Demonstration Team.